We investigate models of charged lepton and neutrino masses and lepton mixing based on broken modular symmetry. The matter fields in these models are assumed to transform in irreducible representations of the finite modular group Γ4 ≃ S4. We analyse the minimal scenario in which the only source of symmetry breaking is the vacuum expectation value of the modulus field. In this scenario there is no need to introduce flavon fields. Using the basis for the lowest weight modular forms found earlier, we build minimal phenomenologically viable models in which the neutrino masses are generated via the type I seesaw mechanism. While successfully accommodating charged lepton masses, neutrino mixing angles and mass-squared differences, these models predict the values of the lightest neutrino mass (i.e., the absolute neutrino mass scale), of the Dirac and Majorana CP violation (CPV) phases, as well as specific correlations between the values of the atmospheric neutrino mixing parameter sin2θ23 and i) the Dirac CPV phase δ, ii) the sum of the neutrino masses, and iii) the effective Majorana mass in neutrinoless double beta decay. We consider also the case of residual symmetries ℤ 3 ST and ℤ 2 S respectively in the charged lepton and neutrino sectors, corresponding to specific vacuum expectation values of the modulus. S.F. King and C. Luhn, Neutrino Mass and Mixing with Discrete Symmetry, Rept. Prog. Phys. 76 (2013) 056201 [arXiv:1301.1340] [INSPIRE]. S.T. Petcov, Discrete Flavour Symmetries, Neutrino Mixing and Leptonic CP-violation, Eur. Phys. J. C 78 (2018) 709 [arXiv:1711.10806] [INSPIRE]. F. Feruglio, Are neutrino masses modular forms?, in From my vast repertoire: the legacy of Guido Altarelli, A. Levy, S. Forte and G. Ridolfi eds., World Scientific, (2018), pp. 227-266, arXiv:1706.08749 [INSPIRE]. T. Kobayashi, K. Tanaka and T.H. Tatsuishi, Neutrino mixing from finite modular groups, Phys. Rev. D 98 (2018) 016004 [arXiv:1803.10391] [INSPIRE]. J.T. Penedo and S.T. Petcov, Lepton Masses and Mixing from Modular S 4 Symmetry, Nucl. Phys. B 939 (2019) 292 [arXiv:1806.11040] [INSPIRE]. T. Kobayashi, N. Omoto, Y. Shimizu, K. Takagi, M. Tanimoto and T.H. Tatsuishi, Modular A 4 invariance and neutrino mixing, JHEP 11 (2018) 196 [arXiv:1808.03012] [INSPIRE]. R. de Adelhart Toorop, F. Feruglio and C. Hagedorn, Finite Modular Groups and Lepton Mixing, Nucl. Phys. B 858 (2012) 437 [arXiv:1112.1340] [INSPIRE]. S. Ferrara, D. Lüst, A.D. Shapere and S. Theisen, Modular Invariance in Supersymmetric Field Theories, Phys. Lett. B 225 (1989) 363 [INSPIRE]. S. Ferrara, D. Lüst and S. Theisen, Target Space Modular Invariance and Low-Energy Couplings in Orbifold Compactifications, Phys. Lett. B 233 (1989) 147 [INSPIRE]. C.N. Leung and S.T. Petcov, A Comment on the Coexistence of Dirac and Majorana Massive Neutrinos, Phys. Lett. 125B (1983) 461 [INSPIRE]. G. Ross and M. Serna, Unification and fermion mass structure, Phys. Lett. B 664 (2008) 97 [arXiv:0704.1248] [INSPIRE]. S. Ferrara, N. Magnoli, T.R. Taylor and G. Veneziano, Duality and supersymmetry breaking in string theory, Phys. Lett. B 245 (1990) 409 [INSPIRE]. A. Font, L.E. 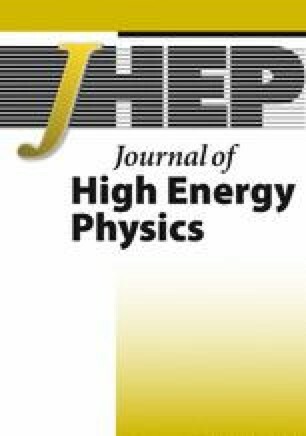 Ibáñez, D. Lüst and F. Quevedo, Supersymmetry Breaking From Duality Invariant Gaugino Condensation, Phys. Lett. B 245 (1990) 401 [INSPIRE]. M. Cvetič, A. Font, L.E. Ibáñez, D. Lüst and F. Quevedo, Target space duality, supersymmetry breaking and the stability of classical string vacua, Nucl. Phys. B 361 (1991) 194 [INSPIRE]. S.M. Bilenky and S.T. Petcov, Massive Neutrinos and Neutrino Oscillations, Rev. Mod. Phys. 59 (1987) 671 [Erratum ibid. 61 (1989) 169] [INSPIRE]. P.F. Harrison and W.G. Scott, Symmetries and generalizations of tri-bimaximal neutrino mixing, Phys. Lett. B 535 (2002) 163 [hep-ph/0203209] [INSPIRE]. L. Wolfenstein, Oscillations Among Three Neutrino Types and CP-violation, Phys. Rev. D 18 (1978) 958 [INSPIRE]. S. Antusch, J. Kersten, M. Lindner and M. Ratz, Running neutrino masses, mixings and CP phases: Analytical results and phenomenological consequences, Nucl. Phys. B 674 (2003) 401 [hep-ph/0305273] [INSPIRE]. H. Ishimori, T. Kobayashi, H. Ohki, Y. Shimizu, H. Okada and M. Tanimoto, Non-Abelian Discrete Symmetries in Particle Physics, Prog. Theor. Phys. Suppl. 183 (2010) 1 [arXiv:1003.3552] [INSPIRE]. F. Bazzocchi, L. Merlo and S. Morisi, Fermion Masses and Mixings in a S 4 -based Model, Nucl. Phys. B 816 (2009) 204 [arXiv:0901.2086] [INSPIRE]. S.F. King and C. Luhn, A new family symmetry for SO(10) GUTs, Nucl. Phys. B 820 (2009) 269 [arXiv:0905.1686] [INSPIRE]. C. Hagedorn, S.F. King and C. Luhn, A SUSY GUT of Flavour with S4 × SU(5) to NLO, JHEP 06 (2010) 048 [arXiv:1003.4249] [INSPIRE]. G. Altarelli and F. Feruglio, Tri-bimaximal neutrino mixing, A 4 and the modular symmetry, Nucl. Phys. B 741 (2006) 215 [hep-ph/0512103] [INSPIRE].